Packing List and Final Tips – Do your dream! We thought it’d be useful to publish our packing list as all our research may benefit some others who may do a similar list. Don’t take any books – they are heavy. PDF any documents you want from WikiTravel/WikiPedia/Train maps/eTickets etc, and save on laptop. Use DROPBOX to sync all these files with the Internet. If you have an Android phone you can install DropBox and DropSync to replicate all documents to phone! – On the maps app, Install the “precache” lab add on, and pre-cache google maps for the areas you are going. Inbuilt GPS and the offline maps will be very handy. We are taking a Laptop as we, well I, use them a lot. For ease, make sure EVERY other device you have can charge from the laptop USB ports which saves carrying loads of power supplies. The Kindle 3G will be very useful. Not only as a book reader, but the free global 3G will mean you can get emails anywhere, and also use the internet in an emergency to find out how to get you out of trouble. Don’t take big rucksacks. We’re taking 2x Berghaus Freeflow V 35+8 rucksacks. Superb fit, small enough, but also big enough. They have a great back system which means they don’t touch your back which is important for air-flow in 30’+ humid heat. Take a small day rucksack that you can stuff in your bigger sack. We will use this for “valuables” – and keep with us if/when we have to put the big sacks in the hold/luggage areas. You can use as a day sack when you go out. Do your research for how to get money. We are taking both Visa/Mastercard credit cards and debit cards, and have what we think is the cheapest combination. See below. FairFX do the $ mastercard debit card ideal for Asia. Samsung netbook, spare battery, power supply, plug adapter, Skype headset. Combination padlock for room doors (apparently needed insome places!). Most clothes are lightweight and quick dry/technical. List is for EACH of us! 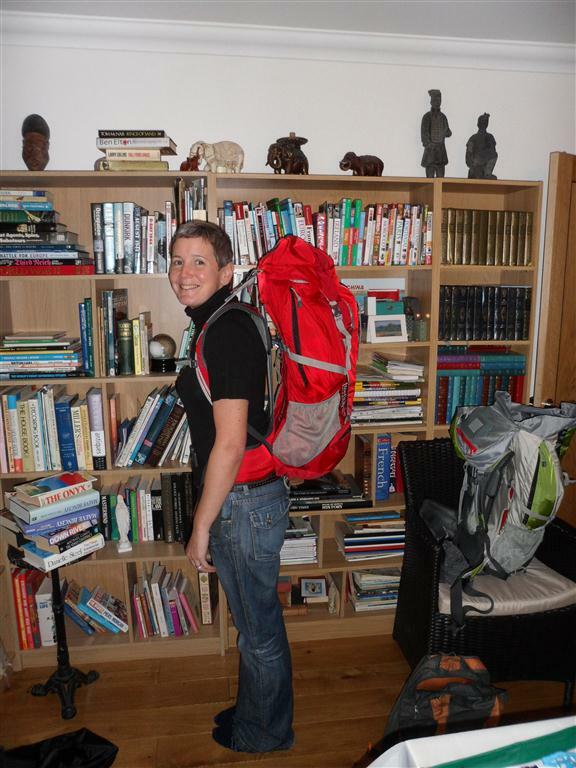 Mels rucksack is 9.5kg, and mine is about 10.5kg which I think is good going…. Must be getting really exciting now – so close to going. Have fun, hope to catch up when you both get back safe and sound. You should revisit this list when you get back – see if you took everything you needed and left behind everything you didn’t. All the best.